My sweet daughter has just started on boarding school, so the house is a little empty without her. Well, now she has been away for two weeks, and it is absolutely time for a little something ;-) And of course also a card. With my daughter in mind, I just recently bought a MFT stampset with sayings from www.happymade.dk, and I had to try it right away. What a beautiful creation! 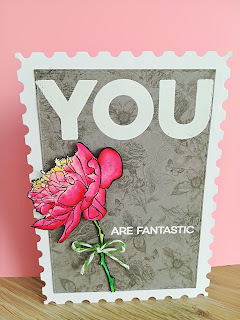 Thanks so much for playing in our ‘Anything using Dies’ challenge at Dies R Us! Please come back again soon! DAR’S CRAFTY CREATIONS Please come for a visit. Gorgeous card Annette! The flower is so pretty & beautifully coloured, & looks wonderful against the grey background.